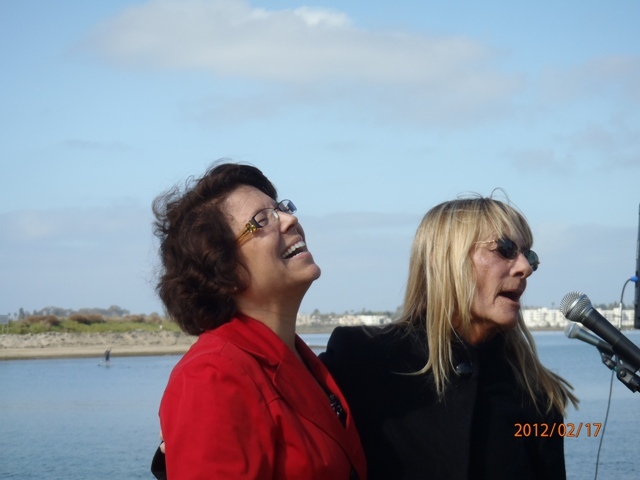 Lori Saldana and Donna Frye in a moment of levity at the campaign kick-off at Mission Bay, Feb. 17, 2012. Photo by Nadine Abbott. Lori Saldaña officially launched her primary run for the June 5th election, for Congressional District 52. She is running against Scott Peters on the Democratic Party Primary. During the event Saldaña highlighted her achievements in Sacramento during her six years in the Legislature. During the event a young man with her opponent Scott Peters’ Campaign tried to disrupt it. His efforts to mar the kick-off event was prevented by volunteers. Lori and supporters listening to music performed at her campaign event. Photo by Tom Abbott. During Saldana’s six years she worked on clean water, which is not a “partisan issue.” It is also not a partisan issue to work on clean sea food, in a city that relies on sea food. During those years she worked with Rick Rudy, a commercial fisherman, on these issues. Mr. Rudy is a commercial lobsterman, and a registered Republican. Saldaña also emphasized the fight for the middle class and labor, and how wages have stalled over the last thirty years. As she pointed out, a master carpenter wages start at around twenty-five dollars, where they were thirty years ago. Another issue that matters to the grass roots are college loans, and access to college. Among the speakers was former City Council Member and Mayoral Candidate Donna Frye. She emphasized that indeed clean water is a non partisan issue and reminded the audience of about one hundred that Congressman Brian Bilbray ran so many years ago on clean water, and as a surfer. His first act in Congress was to defund the Clean Water Act as part of the Contract with America, which she called the Contract on America. 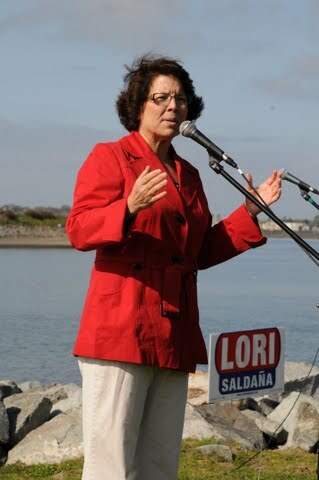 Candidate Lori Saldana. Photo by Tom Abbott. The audience was also told of the strategic use of the non-endorsement vote during the Democratic convention to prevent Saldaña from getting the Party Endorsement. Ms. Saldaña lost this endorsement by one vote, meaning neither candidate can use Democratic Party volunteers to walk precincts, this becomes a grassroots campaign. Mrs Saldaña are ready for this fight. Mitchell Sterling, an attendee the event said: “Lori is somebody who stands for the people, ” and that it is time we have people in Congress that care for the needs of the people and not corporations. As mentioned, a young man with the Scott Peters’ Campaign did try to disrupt the event but was blocked from taking photos by volunteers. As we were told these are common tactics employed by campaigns. This is part of the gutter level politics that unfortunately cares more to do this than face the issues. Suffice it to say this is not exclusive to one campaign, but instead is a problem that now ails the political system. This primary will be interesting since Californians passed Proposition 14 last electoral cycle. Only the top two candidates will advance to the General election regardless of party affiliation. Potentially we may see two democrats or two republicans face off in the General Election in multiple districts. it’s too bad that scott peter’s campaign appears to be using the GOP’s playbook. Either this is a preview of the kind of policies that he would pursue (there are plenty of so-called democrats who gladly do the 1%’s dirty work) OR it’s a dirty trick orchestrated by our county GOP, a collection of truly nefarious characters whose past actions speak for themselves. Anybody get any pictures of these dudes? Let’s figure this out. Um… Tried to disrupt the event by taking photos? Got to agree, was he taking pictures of a poorly attended event? people doing something they shouldn’t? I can’t think of many other ways for someone taking pictures at a public event to be disruption. They were creating arguments, pushing people out of the way to get to the front of the staging area, yelling at supporters trying to reason with them and being disruptive while Lori Saldana was trying to speak. She had to stop speaking a number of times. Scott Peters’s 2 young goons who harassed Lori Saldana’s Campaign kick off was not a good move!!! Many folks who weren’t sure who to support will now be supporting Lori Saldana!!! Democrats who support candidates who act like Republicans are not true Democrats!!! we’d LOVE to have any pics or videos out there of this. OBRagBlog@Gmail. Send ’em in kids! Great start to the campaign: strong kickoff, good media coverage, lots of yard signs getting into people’s yards. Onward to June 5! And thanks to all the volunteers for your help at the kickoff ! Great turnout (120+ people), good weather for precinct walking, and tremendous support from Donna Frye, Richard Barrera (School Board President) , Poway Democratic Club President Mickey Foster, former SD Democratic Club President Stephen Whitburn, Republican businessman Dave Rudie, small businessman Sam Chammas, Internist Joel Trambley and many, many others who supported this great event. Honored to have your support as we work to get Lori into Congress. Taking pictures? Ha!!! Why in the world should we allow these guys to videotape Lori’s speech? So that they can edit it to twist things around and use to their own sleasy purposes later on? I don’t think so!!! We are not naiive now, are we? He was blocked and challenged. Problem is the campaign volunteers missed the guy filming from the top of the hill. Per campaign staff it’s a catch 22. If you challenge and block they start moving. If you don’t they get tape or whatever and edit. This is not limited to this campaign. It is now a prevailing pattern. I’d assume that volunteers wouldn’t have chased away TV cameras recording the event, which means it wasn’t the act that’s in question, but rather specific people being barred from a public event for their political beliefs. That’s a rather unusual stance to take, much less be proud of. But whatever works. I’m Scott’s campaign manager and given the inaccuracy of this portrayal, I feel compelled to set the record straight. The young man at Ms. Saldana’s kick-off event is a supporter of Scott’s. This event was publicly advertised and held on public property, he had every right to be there. It’s a shame that several over-zealous supporters of Ms. Saldana’s campaign felt it was acceptable to harass him. Our supporter did not attend with the intent of disrupting her event. He went to hear what one of our opponents had to say. Contrast this with the office opening we held Friday night. A few of Ms. Saldana’s supporters showed up and we saw this for what it was – eager supporters who wanted to hear what the opposition had to say. This is the fundamental difference between Scott’s campaign and that of the other Democrat in this race. While our supporter was treated with disrespect, we welcomed her outspoken supporters with respect, dignity, and pizza. We know these people to be good Democrats who truly care about the fate of our country and Scott and his supporters appreciated the opportunity to share this moment with them. At no point was there even a trace of conflict. 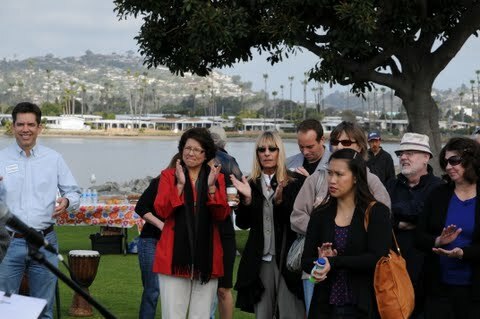 In fact, as evidenced by the news coverage our event received, everyone had a great time. There is so much work for Congress to do and the people of San Diego understand that change really can start here. Scott is a thoughtful problem solver who’s not interested in partisan bickering. Scott believes we need to take a more cooperative approach in resolving the issues we face. As representatives of Scott, we all take great pride in reflecting that attitude, ourselves. I think this is clearly demonstrated in the quality and diversity of Scott’s supporters. I hope this event is isolated and I look forward to a spirited campaign, where we can focus on the real problems that face our country. Oh and Robert if I had known you were doing the kickoff, would have been there to cover as well. Let’s put it this way, since we were there, it was not the taking the photos…you are correct…it is how it was done and the blocking of view by attendees. Regardless, the guy taking photos was there to distract from the person taping from the top of the hill. As a meta observation this is happening more and more across the political landscape…it is not limited to one campaign, or this one. The you tube has many instances of this across campaigns. A few even make it to the national landscape…remember the Macaca momemt? In a way this is what this is about. My personal view, let then! My personal view, let’s have a few honest debates. How about that? And since I am not a resident in the district, I can honestly say I am agnostic. I was there yesterday and Nadin’s story really doesn’t correctly say what happened. But now I see why. I guess it’s too much these days to expect a journalist to be unbiased. First, there’s no way there was 120 there. Second, it was Lori’s campaign who caused the disruption by surrounding and basically attacking the guy. I didn’t even know the guy was there until her people made a big deal of it. I don’t see anything wrong with taking pictures, whoever you work for. That’s what we should want and shouldn’t condemn if we’re going to do that in turn with the crazy Republicans. The behavior of Lori’s fans made me realize I don’t want to be one of them, especially with her reaction to the situation and as someone that believes in open government and the 1st Amendment. I love the OB Rag and it’s too bad this story/author is so biased and didn’t tell the truth. First off I estimated the crowd at one hundred, 120 would be very high. Third, I saw the disruption from the side, and thn as it moved on. Fourth, at a meta level this is what is happening to American politics. On the one hand I get it, why campaigns do this…on the other…it left a sour taste in both my husband and my mouth. That said, I cannot wait for the debate between these two candidates and personally I hope NOT to see this again in campaign in San Diego, sadly I expect it. I don’t understand why Lori and Scott are running against each other? Is there voting strategy that I am not understanding? Honestly, I can’t see voting for a candidate that bases their campaign on clean sea food, increased wages for someone already making $25/hour, and denying citizens the right to take pictures on public property. I was already concerned about Saldana’s support for illegal immigration, her desire to suppress the 2nd Amendment, and the claim that union dues of Border Patrol Agents have been channeled to her campaign funds. I’m afraid I’ll have to look elsewhere for someone to represent me. please, eric, don’t vote for Lori. if you believe all that crap you cited i suggest you vote for a candidate who takes the same hallucinagens that you do. Hallucinogens, mr fresh, not hallucinagens. Interesting that you label Lori’s stated positions as “crap”. I take that as an indication that you won’t be voting for her either. ooooh. and a spelling nazi to boot. where’s that “ignore” button when you need it? cya. Rather than use facts to support your position, you choose to denigrate any inquiry and then run? If this is representative of Lori’s approach, I dare say you’re doing very little to support her campaign. No Eric, let me spell it out for you. Still not a verifiable fact in sight. Instead, it’s professed that an open exchange of ideas is not worth having, and it’s demonstrated that any disagreemnt with that position is to be met with mocking and belittlement. With every response, disdain for the democratic process is exhibited. In fact, this provides a very public display of why citizens are frightened of a candiate, in this case Lori, whose supporters have no qualms attempting to silence freedom of speech. As a journalist, and current candidate for San Diego Democratic Central Committee, who has covered Bilbray’s former race for East County Magazine(Busby 2010) I can personally attest that he uses tactics like disruption on his democratic opponents. I would bet he is up to his old tricks again! Smells like Bilbray. “I have been reviewing the comments section below the article re the Saldana campaign kick off and it’s pretty clear that the young man who came to take pictures did not “attempt to cause a disruption” as is erroneously stated in the headline. Various witnesses confirm this. He came to take pictures and the disruption was caused by Lori’s supporters who harassed him and tried to keep him from doing so. may i suggest to the Peter’s campaign that they confer with the Dumanis campaign about the subject of OBRag removing posts and re-writing headlines? it is what it is… we are not the newspaper of record. we are a blog, complete with warts, farts, omissions, biases and even mistakes. don’t like it? don’t read it. it’s that simple. the comments speak for themselves. and in this particular case they happen to favor the Peters campaign as far as we can tell, since no vids or pics have surfaced to the contrary. so this feels like some power trip to me. i can guarantee you that we will be offering further coverage of Saldana vs. Peters that is more issues focused. Turn about is fair play – The Conservative Order of Good Government is hosting a mayoral debate March 13th – they expect reservations and lunch costs – but – hey? Also, will the OBRag journalists be attending the Congressional debate on Wednesday, Feb 23rd? Seems only Peters and Bilbray are invited. I guess I will make one last comment on this dustoff and add some MORE facts, as seen from the left of the Candidate to the side of the main stage where the participants sat. 1.- There was a disruption, to the point that the CANDIDATE challenged a person, and this person said he was with the Peters Campaign. Whether this young man was or not is besides the question, A second young man was challenged who said he was doing his senior thesis, personally I believe that young man was telling the truth. 2.- To those who say there was bias, the bias seems to come from actually reporting that some kind of a disturbance did happen, witnessed from the side. I SHOULD have rolled tape instead of take notes, I guess… lesson learned… next time I will, and I will trust my tape recorder will do the job. 3.- What bothers me about this situation has nothing to do with EITHER campaign… what bothers me is that this is becoming the state of politics in the United States… and that we literally have situations like this happen more and more often across local and national campaigns. It is not healthy. Entering the realm of commentary and away from reporting… this is not healthy for our democracy. It is time that ALL campaigns, left, right, center, don’t matter, take a step back and realize that at least for people like ME, who HAVE NO VOTE in this particular campaign, it leaves a bad taste in our mouths. One campaign for causing the disruption and the other for raising to the bait. From the side it looked like that. I have no idea how you deal with this as a campaign… but while I can see the fear of whatever being misused in the age of the internet, to a perfect outsider who had never seen this in the flesh, it was not good to watch. Now I will continue to cover these events, and REPORT on what happens in them. If that makes me biased for REPORTING on it… so be it. But ignoring the young man taking photos, and I was not close enough to hear the disruption claimed by others here… or just asking him to do what PRESS was doing, which is take to the outside and take your photos, would have meant no story. At the same time asking volunteers not to stop the behavior, would have meant a different story. But if any event leads to something like that, and it was an interruption, where the Candidate herself had to stop her prepared remaks, it is a story. If reporting this happened in such an event is a sign of bias, so be it. I should know better, our state of reporting is such that indeed if a story does not go the way “it should” it is bias. It’s been like that since Nixon. Suffice it to say, the role of those of us reporting on this is to report on WHAT HAPPENED, and not take sides. Ignoring the fact that the candidate stopped her remarks, would mean that the story would not have been complete. Suffice it to say, this is making the role of the press more interesting as well. As I pointed above my husband was challenged as well. So it is time to start asking the more important question… WHY? WHY are campaigns feeling they have to do this? Now that is the editorial comment of the day, on this story. I think it was necessary to adress this. And I also think it is necessary to know that some of us still believes the public, whoever that happens to be, has a right to know when things like this do indeed happen. Suffice it to say… I don’t even live in the district. But the question that should be asked is… why is this happening (not just here), and what is this doing to our democracy and free exchange of ideas? That is the question, at least in my mind. One edit, asking volunteers to stop the behavior. When my 84 year old Father feels the need to get up out of his seat because of all the commotion and disruption hecklers are causing. This is a problem! He felt it was down right RUDE to disrupt a speaker and went to tell the heckler as much and ask him to move away or leave. My Father wanted to hear what Lori had to say, after all the event was the kick off for her campaign. Scott Peters paid staff member was not a gentleman to Lori, her female volunteers and my Father was appalled by their actions. In my opinion, Lori Saldana is clearly the person to represent All the people of District 52. Could that change? Set the debate schedule. Let voters see both candidates on the same stage answering questions. Both Lori and Scott should be anxious to be evaluated by their employers (The People). If either is opposed to 2 or 3 public debates, he or she does not deserve consideration by the voters. It’s this simple – If one refuses to meet one’s potential employer, he/she will not be employed.